The so-called ‘Cégkapu’ (Company Portal) is an official storage (cloud) provided by the Hungarian state to business organizations. It’s purpose to keep contact with official bodies, authorities and use during electronic administration. The ‘Cégkapu’ will be in full operation from 01.01.2018., actually the companies can (and must) register and open its own ‘Cégkapu’ as storage space. From January, 2018 the companies (and other business entities) will be able to send and receive official documents to and from e.g. municipalities, courts, the Hungarian Tax Authority, Hungarian Competition Authority, and other authorities and bodies. Communication will be fast and trackable with the usage of the ‘Cégkapu’, which is the first step forward the fully electronic administration. Not only companies but other business entities, such as law firms, foundations and also the branch offices of foreign companies are obliged to register and open their own ‘Cégkapu’. These business entities must register their own company portal until 31st of December, 2017. 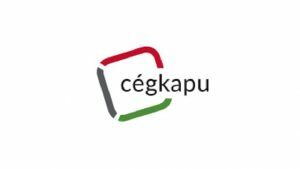 Unfortunately the ‘Cégkapu’ registration website is currently only available in Hungarian, which causes difficulties for non-hungarian speaker clients.